We used to spend 6-8 weeks in Maui each winter as part of a humpback whale research team. One of the fringe benefits of that work was a chance to make a trip to the summit of Haleakala volcano each year, the mass of which comprises most of the island of Maui. Since people seem to have a thing about seeing the sunrise from Haleakala, and the road-clogging bike tour groups coming down the two-lane mountain road are scheduled in the morning, we avoid the crowds and instead visit Haleakala in the late afternoon (after having lunch at the Kula Lodge, which has unrivaled views). 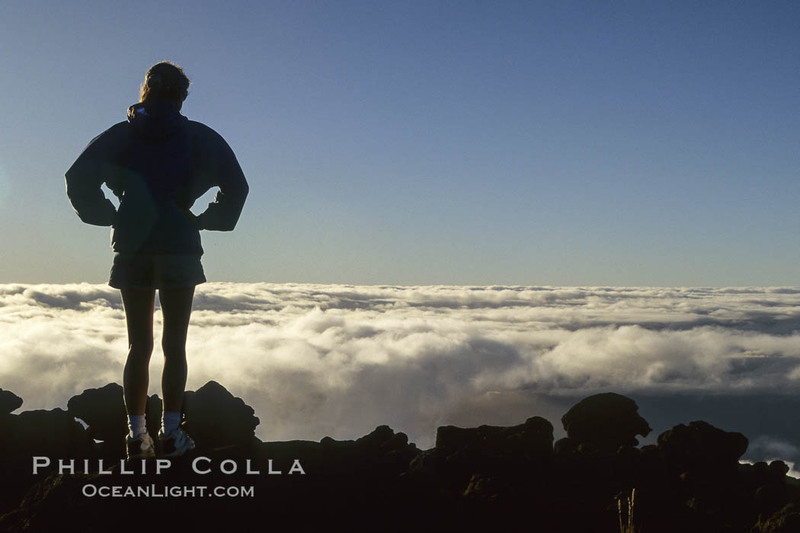 Here Tracy takes in the endless view from the rim of Haleakala, above the clouds, as the sun drops in the West. A motivational/inspirational website just licensed this image, good choice.